iradiophilly | News - Penn State THON 2018; Live Video Stream Broadcast; Donate Now! 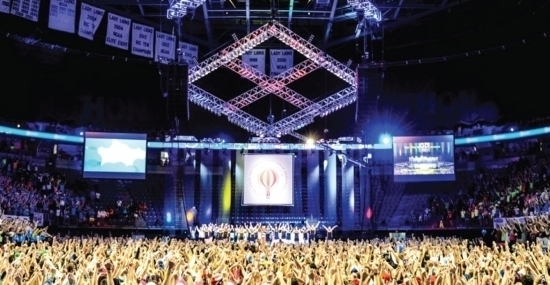 The annual Penn State IFC/Panhellenic Dance Marathon, simply known as THON, is set to take place all weekend long at the Bryce Jordan Center on PSU's campus in State College, Pennsylvania. This is the 41st anniversary of THON. Since 1977, the event has raised over $136 million for the Four Diamonds Fund at Penn State Hershey Children's Hospital helping to fight childhood cancer and raise awareness. Last year alone, it raised $10.04 million with 96% of funds going to the charity. THON is the largest student-run philanthropy in the world with over 16,500 volunteers. Donations are collected year-round culminating with the 46-hour dance marathon. Over 700 students will participate as official "dancers" during the no-sitting, no-sleeping marathon. They will be supported by 10s of 1,000s who circulate in and out of the BJC during the event. The dance marathon will end on Sunday at 4 p.m. with the reveal of this year's total.